Experience the stunning Ford Focus RS at Birchwood Ford in Hastings. The hottest of hot hatches is the latest in a long line of impressive RS models with supercar-beating heritage. With performance features including Torque Vectoring Control which provides unprecedented control no matter the terrain or conditions. The system runs 33 times faster than a blink of an eye and operates at 100 times a second, providing impressive grip and making the RS so fun to drive. The performance credentials of the Focus RS are evident in its athletic styling and aggressive stance, which are both unique and iconic. The flared front end, sporty bumpers and low profile make an imposing impression. Pioneering design improves aerodynamics and engine cooling, while the legendary RS badge is subtly incorporated into the rear wing and front bumper. Inside the Focus RS the visual clues to the new model’s performance and innovation are unavoidable. Sports seats are supportive and secure through the most daring of manoeuvres and the controls feature a contemporary finish. Equally comfortable for hurtling round the track or embarking on long drives, the new Focus RS is more restrained than previous models, giving it a calm and refined feel. The precision-tuned 2.3-litre EcoBoost petrol engine delivers in excess of 350PS. The massive power is harnessed by a range of Ford’s latest groundbreaking technologies. The most innovative feature is the electronic twin-clutch four-wheel drive system which includes drift function, allowing you to send up to 70 percent of power to the rear wheels. 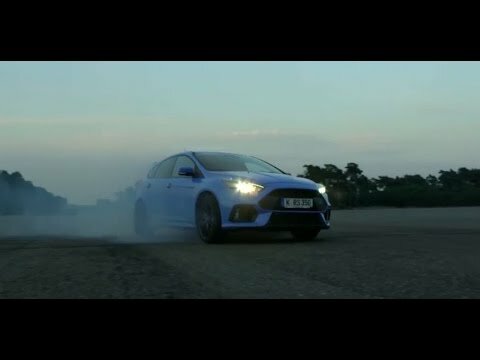 Responsive handling and exhilarating speed combine in the Focus RS to deliver fantastic all-round performance. The Focus RS is now available with Mountune Upgrade, which increases the power output in overboost from 350PS to 375PS and torque increases from 470Nm to 510Nm. To achieve this, we'll fit a high-flow induction kit (cast low-loss crossover duct, silicone hoses and dual-entry air filter), upgraded turbo re-circulating valve and calibration. A Ford Performance badge will also be presented with the upgrade. From only £899 (excluding fitting). For more information, contact us in branch today. The innovative approach towards the design of this new hot hatch has not been restricted to its performance; cutting-edge entertainment and safety technologies bring the wheel of the RS to life in your hands. The streamlined central console is centred on the 8.0-inch colour touchscreen, which makes the Ford SYNC2 multimedia system easy and intuitive to use. View and test drive the Ford Focus RS at our well equipped Birchwood FordStore in Hastings. Book your test drive in just a few clicks by completing an enquiry form or by calling us in branch.